John Archer introduced himself on the Alvis stand at the Classic Car Show in November 2015. He had brought along some of his grandfather’s notes on the Alvis cars which he had owned in the 1920s and we expressed an interest in writing up his experiences. John is a historian, but not of cars, and an article by him was published in the magazine, Who Do You Think You Are? With his kind permission we publish the article below. Cars were to my grandfather, Bertram Rhodes, ‘more than mere machines.’ They were an all-consuming passion. Born and raised in Bowdon, Cheshire, in 1888, transport for his family was dominated by the train and the horse until the day his father purchased a Humber in 1906. That very same day my grandfather went for his first driving lesson on the A56 and that same night began a car diary which he kept up daily until 1941. During those 35 years he recorded the make of every car, lorry, bus and motor bike he drove and also noted the vehicles in which he was given lifts. In total he drove 110 vehicles and covered 412,000 miles. This was by any measure a remarkable achievement. Moreover his daily diary recorded the main towns and communities through which he drove. Overall I have in my possession four diaries or logbooks filled with his neat but tiny script. Bertram and his father were also heavily involved in the Manchester Automobile Club (MAC), particularly before the First World War when motoring was in its infancy and when clubs were important in influencing government attitudes towards the automobile and their owners. In addition to his daily logs of journeys undertaken, he also also kept a hand-written car journal in which he detailed every car he had owned, as well as his father’s cars to which he had access. This amounted to 36 between 1906 and 1941. Of that total three were Alvis cars. Between 17 August 1922 and 16 December 1925 he bought and sold an 11-40 (reg. no. : MB 353), a 12-40 (MB 7424) and a 12-50 (MB 7425). During that time he drove them over 54,000 miles. This high mileage can be partly explained by the fact that he used the cars in conjunction with his work as a chartered surveyor. Working out of Manchester, he covered much of Lancashire and north Cheshire and regularly drove more than 100 miles a day. 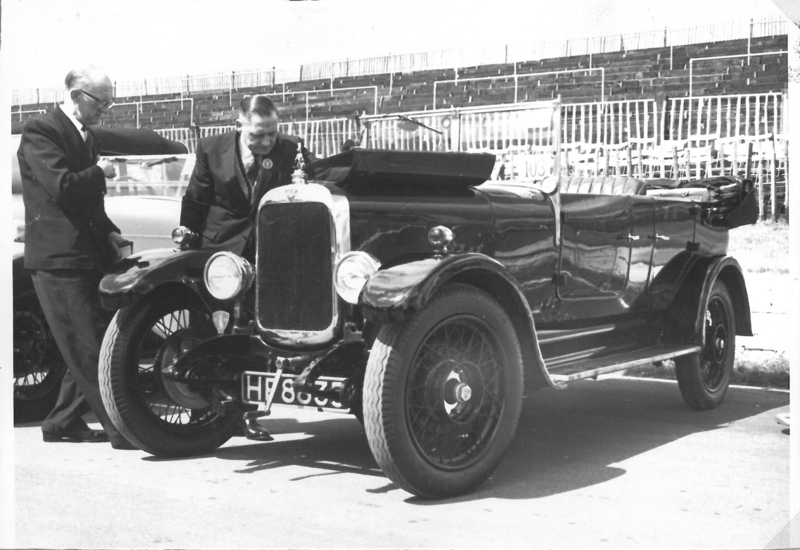 He bought his first Alvis 11-40 (MB 353) on 17 August 1922 for £619 and sold it on 4 March 1925 for £250. This four-seater open touring car, 1598cc, engine number-1782 and chassis number-1431, was painted pastel blue and covered 28,371 miles during his ownership. Based on his notes my grandfather reckoned that he averaged 67.87 miles a day with a petrol consumption of 30.0 mpg. Taking into account depreciation at £369 or 3.1d per mile and running costs at 2.01d per mile, he estimated that the car cost 5.11d per mile to run. On 17 August 1922 Bertram was given a lift down to Coventry in a 10-30 Alvis (FY 4913) where he took delivery of a brand new 11-40 Alvis. He had sold his Austin 10 so this purchase represented a huge step up the social and economic ladder for him as the Alvis had within the space of a little over two years of production carved out a reputation for outstanding quality, despite its uncertain financial foundations. It was in the words of its own publicity, “The British Light Car-de-Luxe,” the ‘car for the motoring connoisseur.’ The Alvis, the manufacturer claimed, met the demands of a ‘critical section of the motoring community’, thus immediately bestowing on buyers of their cars an expertise and kudos which marked them out from the rest of the motoring public. My grandfather, being a car enthusiast, would have loved that particular boast. The Alvis was universally acclaimed as a quality small car just below the likes of the prestigious Rolls Royce and Bentley, consequently they were quite expensive to buy and not many were produced annually. The 11-40 was only produced for one year and the Alvis Register of 1952 described it as a ‘little known model’. In fact Alvis boasted that mass production, ‘as ordinarily understood’, had no part in the car’s production. Hand finished and built by craftsmen the Alvis was an outstanding motor car. Unlike the premier motors the Alvis was smaller and lighter, coming within the Light Car class for tax purposes (£12), but having all the attributes of quality-build, refinement, speed and luxurious comfort. Moreover every Alvis leaving the Coventry works carried a ‘unique Alvis Comprehensive Guarantee’ backed by Lloyds. This entitled the owner to one year’s protection for any breakdown or breakage, including accidents, with a one pound excess to be paid by the owner. Imagine his pride as he drove back from Holyhead Road in Coventry through Staffordshire, and onto the A50 in Cheshire to Altrincham where the family now lived. He may have been able to test the Alvis boast that the car could take most main road hills in 3rd gear, with 2nd and 1st gears being there ‘merely’ for emergency. However he would have been restricted to a maximum running-in speed of 30 mph for the first 500 miles. Once achieved the Alvis gear ratios were such that the car could run between 5 and 55 mph in top gear ‘without apparent effort’ although the makers preferred their cars to be driven hard with frequent changes up and down the gears. No wonder my grandfather loved this car. He had it run in and operating at normal speeds within 10 days of collecting it from the works. My grandfather had competed in MAC reliability and hill-climbing events before 1914 and so it was only natural that he continued to compete. This car was an ideal and serious contender for awards when he took up competing again after the war. As he noted in his diary for the 23 September 1922, he competed in the MAC combined reliability trial and hill climb which ran from Altrincham to Blackburn on the A666, on to the A59 to Gisburn where he turned off to Settle, up to Sedbergh on the A683, across to Kendal to join the A6 to Shap, the bottleneck that was Eamont Bridge just south of Penrith, onto the A592 which took him the length of Ullswater and over and down the steep gradients of the Kirkstone Pass to finish in Bowness on Lake Windermere. The journey measured 168 miles. The Alvis was clearly up to the endurance test as he was the outright winner of the Brooks Challenge Cup organised by the Lancashire and Manchester Automobile Clubs. I have listed the detailed results towards the end of the article. The following year the reliability run took them back to the MAC’s old stamping ground in North Wales. Following some of the smaller A roads the procession of cars moved through Denbigh to Betws-y-Coed, from there they skirted their way through what is now the Snowdonian National Park to Porthmadog on the coast, back up to Beddgelert and finishing in Betws-y-Coed. This journey measured 148 miles. This time the Alvis came third in its class. The 1924 competition, again in North Wales, proved less successful due to a poor hill climb result, but the petrol consumption was quite good. Whilst owning this car grandfather clocked up his 100,000 as a driver since learning to drive back in 1906. It was achieved on 28 March 1923 in the Llandudno area. Interestingly and remarkably his car diary noted that he had travelled only 110,000 miles either as a driver or a passenger in vehicles over the same period. That he had been driven as a passenger for only 10,000 miles is quite hard to believe, especially during the war when his record keeping was less than exact. Looking at his daily entries it is evident that he still commuted to his Manchester office by train, rarely driving into Manchester, the exception being when my mother was born in August 1924 in a Manchester maternity hospital. He used the car for surveying appointments in the South Manchester area. Whilst seasonal motoring had been very much a feature of the pre-war era, the car was still not used to any great extent during the winter months. In January 1923 it was driven on only seven days, eight days in December 1923 but a surprisingly high 15 days in January 1924. However from December 1924 he uses cars on a much more regular and frequent basis during the winter months. This may be because my grandmother was very ill for a number of weeks and required lengthy convalescence in a nursing home. I say cars as he mentions driving a 30 Daimler (MA 9561), 12 Austin (ND 2762), 7-17 Jowett (MB 6742) and was driven in a 16-20 Sunbeam (HP 4732) between December 1924 and the end of January 1925. The Daimler was his father’s car, George who had died in September 1924. He drove MB 353 to Manchester to the Alvis sole agents in the city, British Tractors Ltd of Bridge Street, off Deansgate. Some of that money went towards a second car. In conclusion the 11-40 Alvis was in my grandfather’s words, ‘a car in a thousand, with a marvellous performance. All my memories of it are pleasant.’ He regarded himself as foolish for selling it for his next Alvis, a 12-40 (MB 7424). My grandfather’s car purchasing activities in the mid-1920s became frequent and complicated. In 1925 five cars passed through his hands, three of them Alvises. This was partly a result of his new wealth, both as a successful businessman and as a beneficiary of his father’s will. This Alvis was a slightly improved version of the 11-40 which he had loved so much. He bought it on 6 March 1925 for £500 and sold it on 16 December 1925 for £290. During this time he drove 13,032 miles and the petrol consumption was 28.8 mpg. It was a four seater, Royal Blue De Luxe model, 1598cc, chassis number-8550, engine number-3480. His daily average mileage was 58.96 miles and the running cost came to 1.54d per mile. Taking into account the enormous depreciation of £210 or 3.85d a mile, the total running cost came to 5.4d per mile. Although he admired this car it did not appear to generate quite the same enthusiasm. His trust in the marque, however, did not diminish. In May 1925 he drove over to Filey in East Yorkshire where he dropped off his family and returned to the family home in Hale all in one day, a journey of 245 miles. Just over a week later he drove back over to the East Coast, returning home by rail and drove his other even newer Alvis 12-50(MB 7425) back over to Filey the following day. With the two cars now over on the east coast he alternated them almost on a daily basis until the end of June when he drove the two cars back to Hale on consecutive days. This period, probably, represented the peak of his car ownership experience. He was not only a two-car owner he was a two-Alvis owner. On 16 December he drove the car to Manchester where he sold it. In its place he bought a 8-18 Humber (FY 8521) which he used for professional purposes around Manchester. He bought this car just a month and a half after purchasing the 12-40, paying £619. He sold it on 8 July 1926 for £400. During that time he covered 13,402 miles, and drove it on 158 days at an average of 84.17 miles per day driven. During the same period he did 10 journeys of over 200 miles in a day. The petrol consumption was lower than the previous two cars, returning 25.1 mpg. Adding the depreciation and running costs together this car cost 5.9d a mile to run. His journal continued, ‘Some of the most outstanding being from Chelsea to Hale on May 25th 1926. From Hale to Filey and back in the day on May 7th 1925. To Abberley, Worcestershire and back from Hale, taking my nephew George to his prep school for his first term on May 5th 1925. To Llandrindod Wells and back from Manchester on July 7th 1926. I competed in several reliability trials and competitions with this car. A two-day trial organised by the MAC and LAC and sponsored by the Daily Dispatch, all round the Yorkshire Dales and the Lake District on July 10th and 11th 1925. Results of his competitions with his Alvis cars in LAC and MAC trials 1922-1924. 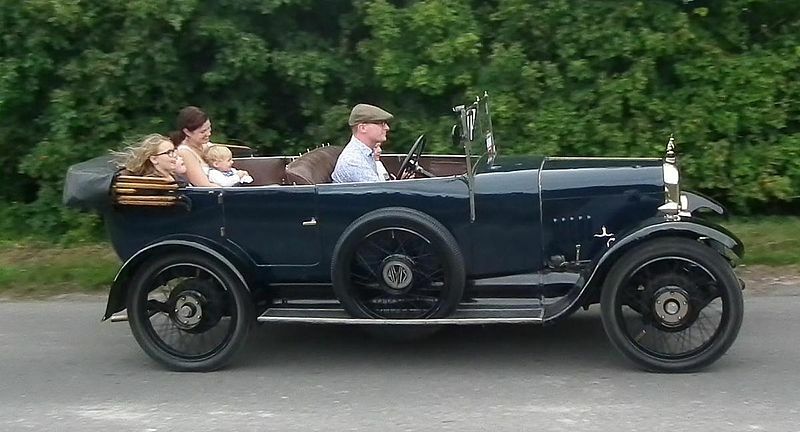 As his family were growing in size, and this sports model was not a family car, he exchanged it and the Humber 8-18 for the larger 14-40 Sunbeam. Described by the present day Alvis Owner Club as ‘immortal’, the 12-50 was the very essence of a sporting tourer, and one that is credited with later saving the Alvis marque. Collecting it from the Alvis works in Coventry grandfather drove it home on 20 April 1925 and spent the next day showing it off to friends and relatives in the Hale, Bowdon and Altrincham neighbourhood as well he might. This 12-50 four-seater Sports represented Alvis’s top of the range model, ideal for ‘very fast long distance touring.’ Given that he spent £78 on extras I think he must have treated himself to front wheel brakes for an additional £20. This car soon became an indulgence that was difficult to justify. I suspect my grandmother, whilst looking after three children under the age of six, complained loud and long about this and other cars. She claimed later that they would have been well off had it not been for grandfather’s love of cars. Whatever marital tiffs this car generated it is clear that he loved every minute of owning it and emphasises unequivocally the difference between owning a car that takes you from A to B and one which turns heads and makes the heart sing with pride and pleasure. He seems, as a result, to have saved this car for longer journeys although. The day before he sold it in July 1926 he drove to Llandrindod Wells and back, a distance of 260 miles, in one day. Being an Alvis, a marque that had been developed through competition, it was hardly surprising that my grandfather took to competing again. By now the M.A.C. sometimes joined forces with the long-established Lancashire Automobile Club (1902) in organising rather grand rallies, trials and hill climbs. The one sponsored by the Daily Dispatch, a popular newspaper published in Manchester with a half million circulation, in July 1925, took him over a distance of 420 miles in two days. Looking at the map it was an incredibly circuitous, hilly and picturesque route. On day one he left Manchester, up to Bolton, from there back through some of the Pennines taking in Oldham, Rochdale, Littleborough, Hebden Bridge, Burnley, Gisburn to Skipton and into the Dales taking in famous beauty spots such as Hawes, Butter Tubs Pass, Keld to Tebay and then over to Kendal, finishing in Bowness by the side of Lake Windermere. The second day took the cars through the Winster Valley to Bowland Bridge and then up the steep Tow Top before dropping down to the A595 at High Newton , from there to Duddon Bridge, through some hills and back to Torver and Coniston. To Ambleside and up the notorious ‘The Struggle’ to Penrith and then back through the northern Dales via Appleby, over the top pass Tan Hill Inn, the highest pub in England, to Richmond down to Ripon and on to Harrogate, Leeds, Huddersfield and back down into Manchester. This lengthy and challenging second day’s journey took him, by coincidence, close to where he eventually retired at Bishop Monkton. Given that he had an Alvis 12-50 it is surprising that he only manages fourth out of 30 in his class. He was somewhat more successful later in September when, as a visitor to the Rochdale Automobile club, he won their hill climb and reliability trial over a lengthy course of 190 miles. As with the previous trial, this rally took him into the Pennines through Hebden Bridge and then back to Burnley and onto Skipton where the cars turned off to go through the Yorkshire Dales as far as Hawes before returning by a slightly different route over the tops by Wether Fell to Skipton, and then back to Rochdale. This period seems to have been a final fling at motor competitions for just six days later he competed in another hill climb and reliability trial going over Belmont to Clitheroe to the Dales once more. Driving as far as Ingleton he returned through the picturesque Trough of Bowland to Sale. Only this time he experienced a serious mechanical fault which affected performance but seemingly not petrol consumption. It was while driving the 12-50 in May 1926 that he clocked up 150,000 miles of driving since 1906, an impressively high average of 7500 miles a year over the 20-year period. 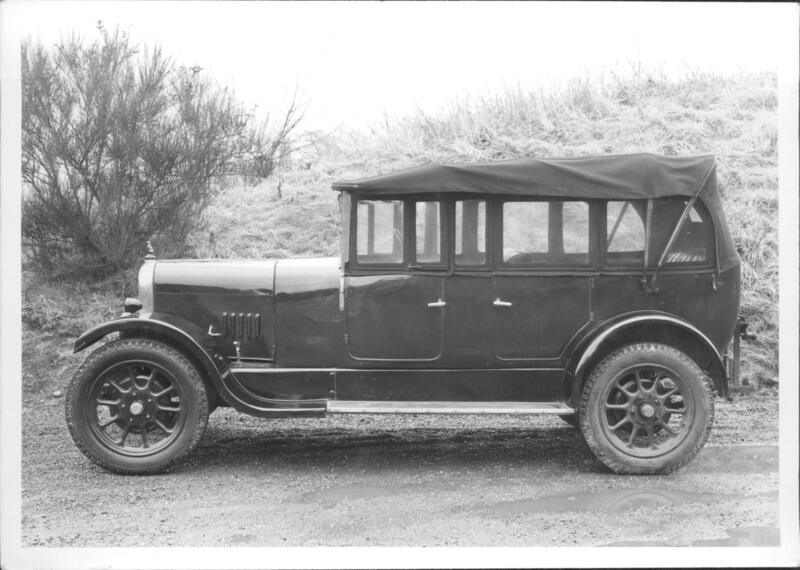 It also appears from his daily log that he used this car and the Humber to carry neighbours to Manchester and back during the General Strike in May 1926. For four years, when his finances were good, my grandfather was able to indulge his passion for well-engineered and fast cars. In that short time he bought three brand new Alvises, each arguably slightly improved on its predecessor. His Alvis days ended when he sold the fine and refined four-seater 12-50 sports tourer, a not altogether suitable car for a man with a growing family. With its sale in 1926 he ended his competition days which had begun in 1910 when he had entered and won the MAC reliability run to North Wales in his father’s 18-24 Austin. In that short period of 16 years between 1910 and 1926 he had driven scores of vehicles, most of them on the Western Front in Northern France and Belgium, sometimes in the most extreme conditions. Consequently driving his Alvis cars through the most picturesque countryside of northern England and Wales in the early to mid-1920s must have felt a sublime and uplifting experience. It is hard for us to imagine just how wonderful, liberating and joyful the feeling must have been to drive an Alvis, or any car for that matter, through the quiet country lanes so soon after a world conflict of unimaginable horror. MB 7424 is a 12/40 TC, chassis 3131, engine 3480, car 8550, Cross & Ellis four seater tourer no 2364. Both cars supplied by British Tractors Ltd, Manchester, but surprisingly at widely differing dates, 20/10/1924 for the former , 20/4/1925 for the latter. Maybe part of a block allocation by City council to a dealer? None of the cars are known to have survived. This fine collection of period photos from N Douglas Simpson in the AAT Collection just falls in the vintage category. The car survives with a current Register Member. Norman Douglas Simpson was born in Carlton Miniott, near Thirsk in the North Riding of Yorkshire on 23 September 1890, the son of a vicar, Reverend James Douglas Simpson (died 1936) and Elizabeth Saunders of Airy Hill, Whitby, Yorkshire, who was the daughter of a wealthy landowner, Charles Saunders. In 1904, Simpson attended Clifton College, Bristol, and in 1908 he went to Trinity College, Cambridge (his father’s college) and read Botany and Zoology graduating BA with a third in Natural Sciences Tripos in 1911. Simpson was a keen mechanic, motorcyclist and motorist and in 1915 he joined the Red Cross as a motorcyclist and was sent to the Hospital at Poperinghe in Belgium. In November 1915 he enlisted in the Army Transport Corps and rose through the ranks being promoted to Captain and served until 1920 when he was discharged. After the war, Simpson went to live with his father at ‘Maesbury’ in Bournemouth, who had retired in 1916 and moved to Bournemouth from Yorkshire as he had family there and after his father’s death Simpson lived at ‘Maesbury’ until his death. In September 1930, the Colonial Office offered him a job as Systematic Botanist in the Agricultural Department at the Peradeniya Botanic Garden, Ceylon, on a wage of £720 per annum and a pension. He bought his beloved car, the Alvis 12/50 for £395 which he took to Ceylon and was still driving his car until his death in 1973. The post ended abruptly in 1932 as they abolished his post and he returned to England in September 1932 via the Far East, Japan and the United States of America. Simpson then settled at ‘Maesbury’ and as his family were wealthy, he never sought paid work again. He spent his time collecting, indexing and arranging his Herbarium. He travelled much in order to collect specimens and map the flora of various countries, such as Morocco, Algeria, Tunisia (Simpson had a knowledge of Arabic), Ireland (where he botanised Ireland with various others) and Jordan – all in his Alvis car which had a plant press in the boot. Simpson died on 29 August 1974, just short of his 84th birthday from a heart condition. On the death his Herbarium included 5,800 sheets from Egypt, 1,580 from the Sudan, 400 from Jordan, 600 from Morocco, 800 from Algeria, 500 from Tunisia, 600 from Cirenaica, 18,100 of British and Irish plants and 1,300 of Continental European plants which he collected from 1903-1973. The Sudan, Egypt and Jordan collections were deposited to The Royal Botanical Gardens, Kew and the rest to the Natural History Museum. His main collections of botanical books were presented to the Botany School at Cambridge, The Natural History Museum, Royal Botanical Gardens, Kew and Reading University. 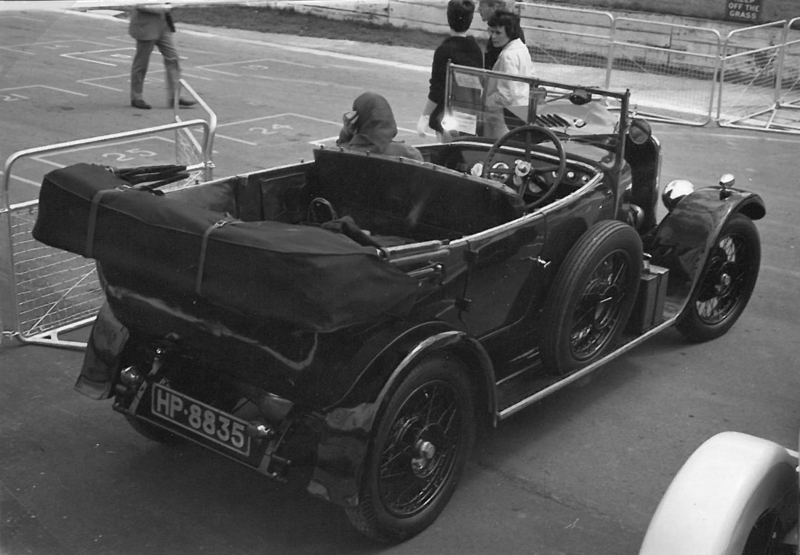 His father Reverend James Douglas Simpson owned Silver Eagle TC 19.82 Mayfair Drophead Coupé LJ 7368 from new on 30 March 1933 until his death in 1936, when it passed to his son Norman Douglas Simpson (the botanist), Maesbury, 3 Cavendish Road, Bournemouth BH1 1QX, until his death in 1974. Nick Wright wrote: First, congratulations on a fascinating website. I was pointed towards it by Chris Chilcott, writing in the Alvis Register Circular. I discovered all the old photographs, and while I didn’t really think I would find a picture of my 12/50 I searched eagerly (and slowly – there was much to catch my eye!). In fact I DID find some pictures of my car, 1924 12/50 HP 8835. Both pictures look to have been taken at an AOC meeting – perhaps Crystal Palace 1962? ­– while the car was in the ownership of Jim Wallace, who restored it. Jim only used the car for a short time before selling it, but before it found a new owner it starred as Sir Edward Elgar’s car in Ken Russell’s ground-breaking BBC biopic. I have had the car (picture attached) since 2012, and it is still pretty much as Jim restored it – a very original, and very early 12/50. By the way, I can identify photo 2-57-3. It is DB 6390, car number 9171. Is it possible to get all informations from my Alvis Speed 20 you have?